I and Jason Huggins (@hugs), of Tapster Robotics, will be giving a conference at the 2018 Hackaday SuperConference. The conference will be “Getting Started in Small Scale CNC and Robotics (Build a CNC Badge)”. By the end of the workshop you will have built, programmed and learned to use the DrawBot Badge. The badge is way more than that though. The badge PCB is a very capable general purpose CNC/Robotics controller. We considered every small scale CNC machine we could think of and made sure this badge could control it. Here is what it can control. You can’t use every feature at once, like the Laser PWM and Spindle PWM are the same signal, but they are broken out logically to multiple, machine specific, connectors. It is all powered by an ESP32 running Grbl_ESP32, which provides serial, Bluetooth and WebUI interfaces. The first half of the conference will cover tips and tricks for getting started with making and controlling small machines. We will also learn and use some basic gcode to control some motors and other items. It is a just a basic intro to get you started and discover some resources. 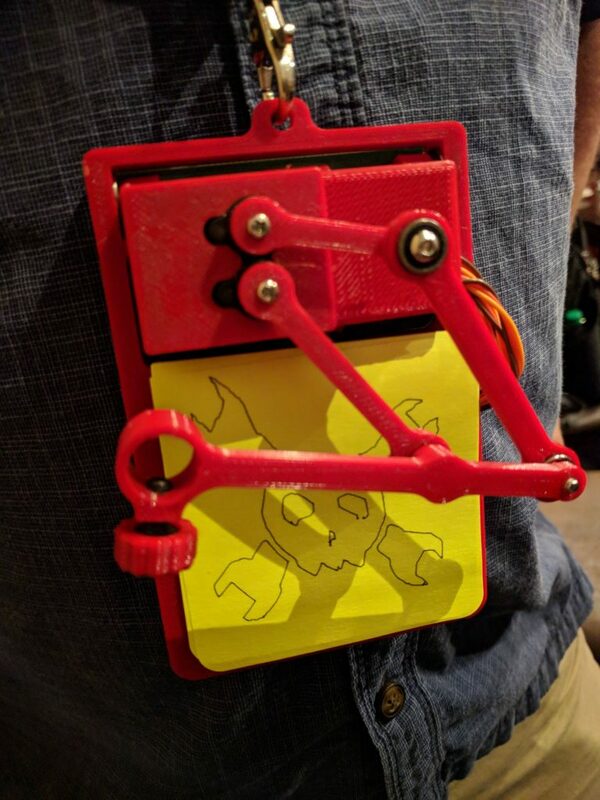 During the second half we will build the DrawBot badge. If you are interested, sign up for the conference and be sure to get into the workshop when that is posted. The workshop will be limited to about 20 people, but I will bring extra badges for sale and will be happy to help build and hack them all weekend. I will also bring extra motors, servos, switches, etc for hacking up simple machines. Within the next couple weeks, all of the documentation will be released. Badge kits will also be for sale on Tindie after the conference. This entry is filed under Art, CNC, Digital Fabrication, DIY . You can follow any responses to this entry through RSS 2.0 . You can leave a response, or trackback from your own site.